Welcome to the first monthly Celebrate Travel blog carnival sponsored by The Mother of all Trips, Walking On Travels, and WanderMom. Every month we’re going to have a little party in honor of a different quirky holiday in the way that we best love: By sharing a curated list of themed blog posts from travel bloggers. Did you know that March is National Umbrella Month? What better time to share tales of travel weather than during a month that celebrates one of the ultimate traveling necessities. My own travel weather story actually has to do with a time when umbrellas were no help. 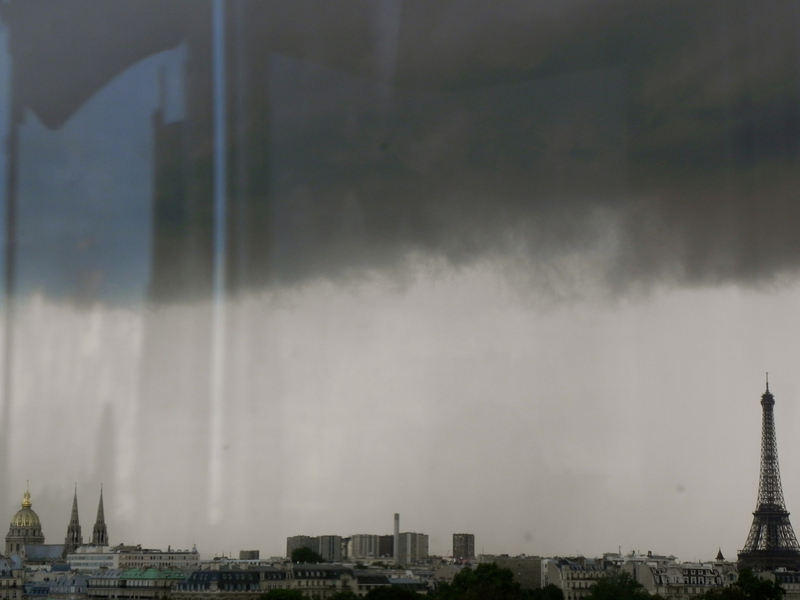 It happened during our last full day on a trip to Paris in the summer of 2012. 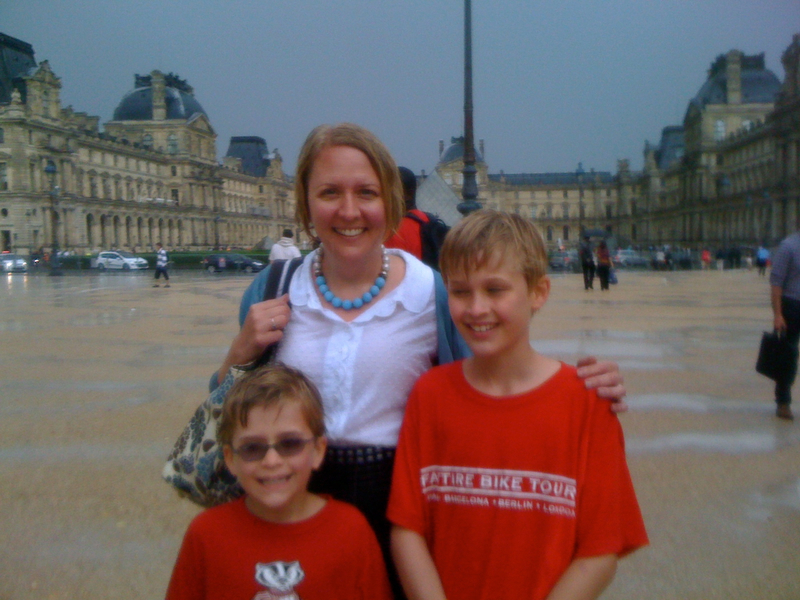 We were in the Tuileries Gardens on the giant Ferris wheel that takes up residence there next to the Louvre every summer. For a variety of reasons on this trip we had spent a fair bit of time in this large open space right in the center of the city and and every other time it had been gorgeously clear with a blue sky full of fluffy clouds worthy of a Fragonard painting. But that day it had already showered a few times earlier and we watched, a little uneasily, as clouds advanced across the gray sky in threatening line. Please click on photos for full-size versions. We disembarked and starting walking toward the Louvre. One minute I was speculating that the rain might start before we made it to the safe and dry confines of the Metro station, and the next, a drenching downpour blew in pushed by a shockingly fierce wind. It was as if someone had opened a spigot. In an instant, the water soaked not only my blouse and skirt, but my skin underneath. There was scarcely time to react, but seven-year-old Teddy did – with absolute and utter delight. He shrieked at the top of his lungs and tore along the crushed stone pathway toward the Arc de Triomphe du Carrousel, the gateway to the Louvre’s courtyard built by Napoleon and the smaller first cousin of the huge arch that so famously dominates the Champs-Élysées. There was little option but to take off after him. My husband Matt and ten-year-old Tommy were somewhere behind, moving inexorably with the crowds of people for this small bit of shelter. I watched my youngest child galloping, breathless with laughter and started to giggle myself, not really sure just what was so funny. Then, almost as quickly as it had started, the rain stopped. We emerged, blinking. If the quality of this photo isn’t too high, that’s hardly surprising given that Matt took it with his drenched phone, which stopped working immediately afterward (happily, it just needed to dry out). We had to make an immediate change of dinner plans, since going back to our apartment and putting on dry clothes was now imperative. But even with the inconvenient and cold Metro ride home, this remains one of my favorite moments of our trip. It felt like such an adventure to be soaking wet in the middle of Paris and it created a memory that all of us will pull out and polish as we retell it for years to come – much more so than simply riding the Ferris wheel would do. Jody at Ireland with Kids also believes that rain is something to be embraced, writing “Ireland is famous for it’s 40 shades of green. And equally as famous for how it gets so green- lots of rain! As the saying goes, ‘If the Irish waited on the weather, they would be forever waiting.’ And that is exactly the attitude visitors should take, as well.” Get her tips on rain gear for Ireland. You probably don’t think much about what happens to Mickey Mouse when it rains, and indeed, Walt Disney World is a fun place for a family vacation. But Orlando’s variable weather often can make the experience less than wonderful. Beth from The Vacation Gals provides some tips for dealing with rainy days at the Walt Disney World theme park. And just what happens when that rain turns into snow? Tawanna at Mom’s Guide to Travel doesn’t mind getting caught in certain types of weather while her family is traveling, saying “We recently got caught in a snow storm in the Pocono Mountains and though it was totally unexpected, it was appropriate. And thankfully, we had all the necessary layers, ski wear, goggles, and hand warmers we needed to weather the storm. In a situation like this, an umbrella would have been useless (and less fun). For people living in Minnesota, winter weather is always a consideration in travel planning. When snow and ice threatened to cancel a Christmas trip for Linda of Minnemom, creativity jumped in, and the phrase, “What’s another 500 miles?” entered her family’s travel parlance. Read the first-hand account of how a weather detour changed her family’s path to Texas. Let’s not forget the opposite of snow and rain which is scorching heat. Nicole from Arrows Sent Forth spent a week vacationing with two young kids and no air conditioning last summer when the temps hit the upper 90s in northern Michigan. She shares many ways to keep the whole family cool, from babies to grandparents, and a few products you should be sure to pack if you’ll be traveling during a heat wave. And finally, sometimes travelers have to be prepared to take shelter from travel weather events in unlikely places; as Jessica from Suitcases and Sippycups reveals, there’s no place like Walmart. 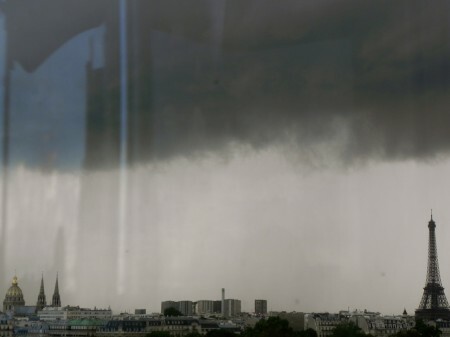 Rain in Paris? I’d find that exciting too. Sometimes I think the rain in other countries have personalities of their own and don’t behave like the rain I experience here in the North East. Call me crazy but it seems that way. Great post and thanks for including us in the carnival. I agree Tawanna – I’m from New England and thought I’d seen changeable weather, but never anything quite like that storm. And yes, there are worse places in the world to get wet! I didn’t know March was National Umbrella month. Shouldn’t it be April (April showers, bring May flowers)? Fun posts. Maybe it’ll help me not be so bitter the next time I travel and get caught in the rain. April has its own slew of fun holidays though, Maybe they chose March because it contains the first day of spring? All I know is that it was pouring here when I wrote this, so it sure seemed appropriate. Love Teddy’s reaction – kids are so much better at finding the joy in getting soaked to the bone that we adults are! Such a great memory – and a story that will no doubt be talked about in your family for years! Love the idea of the Celebrate Travel carnival – thanks for organizing! Yes Lisa – joyful Teddy and his happy female counterpart Emma need to get together on a rainy day somewhere for sure – I think the happiness quotient between those two would be off the charts. That photograph of you and your “soaked to the bone” sons is a KEEPER. What a photo! It’s fun to think about how sometimes, circumstances beyond our control, like bad weather, can result in special travel memories. I like this Celebrate Travel carnival. Look forward to reading the next one! ANd now, to read some of those enticing posts you’ve mentioned here. I was so glad Matt’s phone died AFTER he took the picture! Otherwise there would have been no evidence. I had shoved my camera to the very bottom of my purse (which thankfully kept it dry). If Teddy keeps that attitude, it will serve him well for years to come. That’s a great story. I am looking forward to reading the rest of the stories included here. Thanks Allison – I loved all your stories too. Yes Michaela – although we may not have chosen to get caught in the rain, it certainly made for a great memory. What a fun story! These really are the best memories-the mishaps of family travel. Thanks so much for hosting the carnival! You did a great job of curating the posts. Jessica, your post is going on my list of favorites. I can totally imagine us being in the same situation! Thanks for including my post, I’m glad to be part of such a great lineup! Thank you Cassie – I just love your post. Have fun in Paris. What a great selection of posts. So proud we’ve featured in such a wonderful carnival. Rain can completely change your experience of a destination and it’s wonderful to hear so many stories where it features! Thank you for hosting Mara. So glad you joined our carnival – As a traveling parent, I know the perils of being in charge of someone else’s gear. oh. i love it. this is wonderful. can’t wait to join your next carnival. 21 hours ago by motherofalltrips Terrible drive today but made up for it by eating all the (uh-mazing) pizza.